My Electricity and Magnetism professor timed the date of our second exam perfectly: Halloween. It was awful and terrible and one of the most frightening exams of my life, but I think I did rather well! This dress is, and probably always will be, one of my favorites. It was the first obviously science themed dress that I ever found. I bought it from Modcloth this past spring. 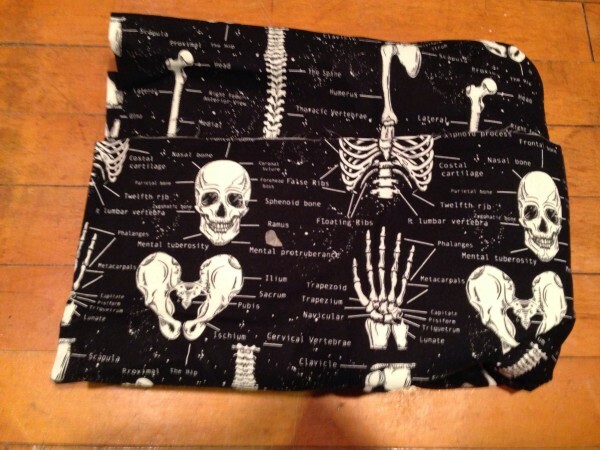 I love the fabric because it GLOWS IN THE DARK! I thought it was very appropriate for Halloween! I found these earrings at a comic convention in the summer and this awesome necklace is from Modcloth. 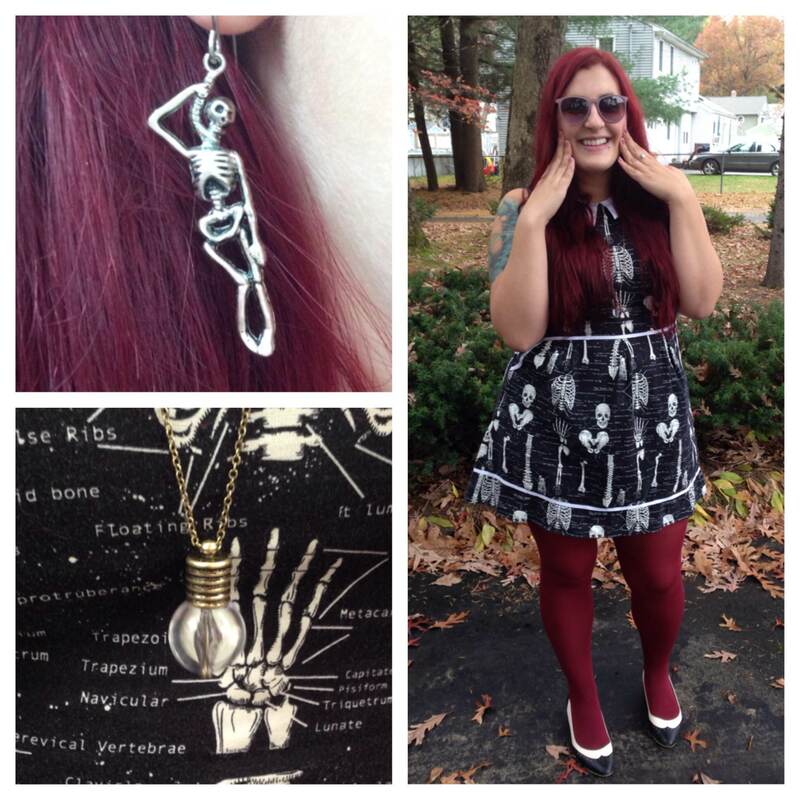 Pairing the necklace with this dress reminds me of the scene in Addams Family Values where Uncle Fester is electrocuted and instead of dying, he appears with a lightbulb in his mouth! I am definitely going to be watching both of the Addams Family movies this evening! I love this fabric so much that when I found it on Fabric.com I ordered 10 yards of it! Not only is it the same pattern but it also glows in the dark. Until this week I did not have anything urgent to make with it. I eventually want to sew some pillows for friends and maybe a shoulder bag. 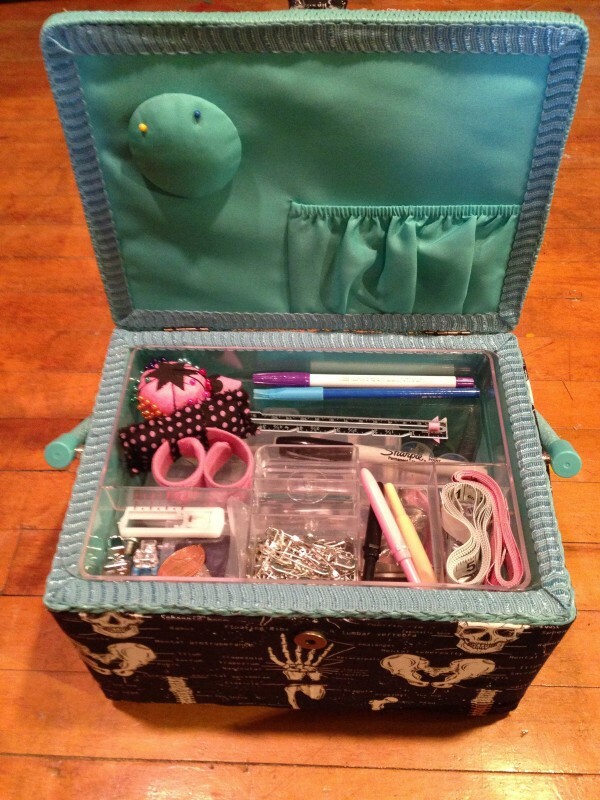 But I recently realized that I desperately need to keep my sewing “stuff” organized. 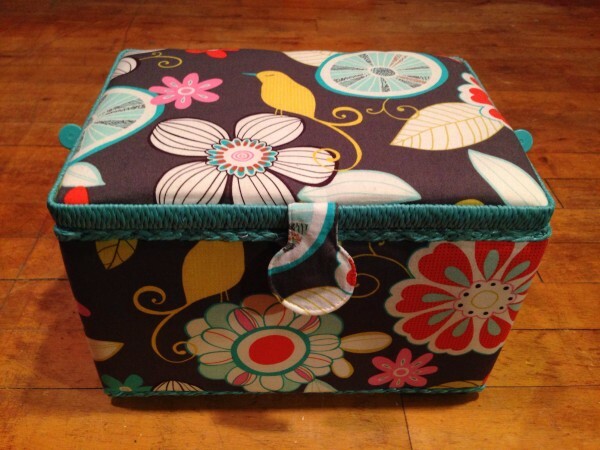 So I searched high and low for a nice sewing basket and came up empty handed. I did not like any of the fabric designs, so I just bought one that had a general color scheme that I liked because I had an idea of how to change it. I really only like the wicker color of this basket; I really dislike the fabric pattern. It is just not unique enough and doesn’t match my personality much. So I figured why not reupholster it! 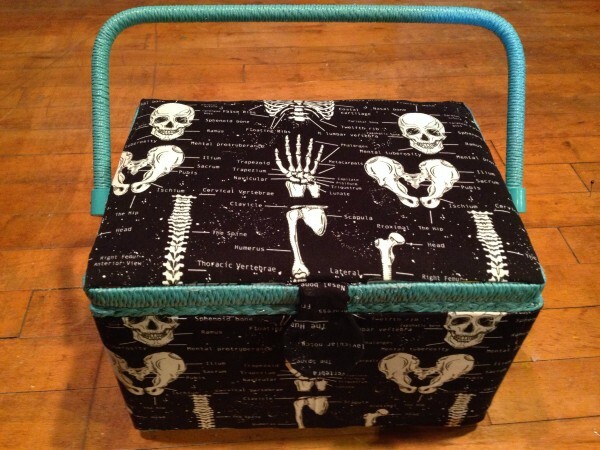 I have a bunch of really great fabric, and with the teal wicker, I thought the black and white skeletons would look great. I spent this morning applying the glow-in-the-dark fabric with a staple gun and some hot glue. I am so happy with how it turned out! Now everything I use to sew is organized! I hope you are all enjoying your Halloween! I haven’t dressed up yet; the party I am going to is tomorrow night! I will probably consume some pumpkin food tonight though. I bought some pumpkin egg nog at the store today. I am so excited for the holidays to be here, but a little overwhelmed since that means final exams! What is your favorite “holiday season” holiday? I think Thanksgiving might be mine, because I really like stuffing! Also, getting a break from the fall semester is nice; Thanksgiving is the time when all the exams and papers pile up and you really need a weekend off. ← Terrible Lizards, Terrific Look!